One of my favorite things to eat is Fish. Whether it’s grilled, fried, made into a curry or even smoked. 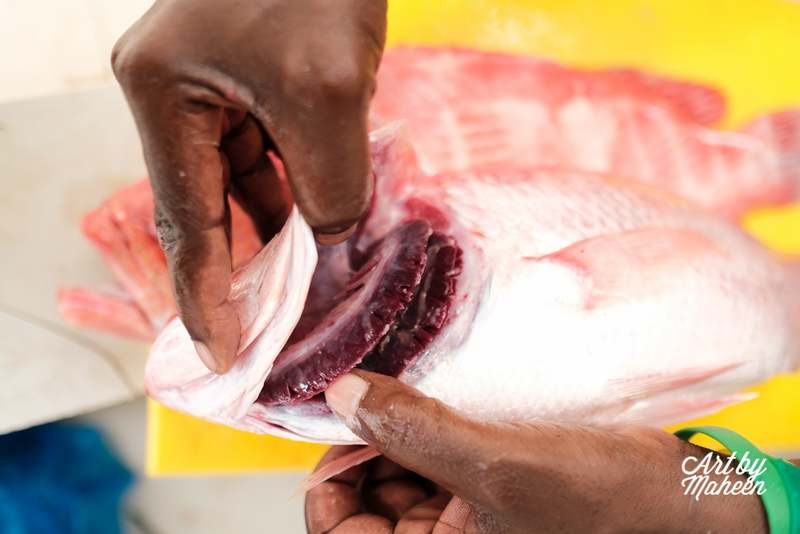 Living in the coastal city of Dar Es Salaam, we are privileged to have access to local fish and seafood. Tanzania’s meat supply whether its beef or chicken has struggled to provide fresh and healthy choices. The availability of organic chicken is extremely difficult to find and beef quality is never consistent. Furthermore, over the last decade or so meat consumers have become more health conscious, hyping up demand for fish. As a family, we consume a whole load of fish. It’s fresh, healthy, easy to prepare and you can have it for lunch, dinner and even breakfast! With so many options it’s my go to protein. I met Hamisi some 7 years ago when he was selling the evening catch along the street near my house. I asked him to bring me his best fish the following day and that was that. Hamisi came to Dar Es Salaam in 2000 after he failed his 7th grade exam at a school in Mtwara (his home town). He came to the city and started working with his brother selling fish at their stall in the Msasani Fish Market. Soon he learnt to differentiate between fish that were in demand, those that were fresh, dynamited, and how to haggle during the auctions held by the fishermen. He then developed relationships with customers through his stall and eventually started delivering directly to their homes. “Wateja wangu wengi ni Waafrika, sehemu za Mbezi na Changombe” (Most of my customers are African living in Mbezi and Changombe). Delivering directly means Hamisi could avoid harassment faced by street vendors and concentrate on selling his fish. This is Hamisi showing me the King Fish he has brought for me. “Dynamite fishing is done mostly by new fishermen who want to make a quick buck. They use plastic water bottles, stuffed with explosives and rocks. The fishermen then dive in to look around for areas with fish. Once they’ve identified a target, they swim to safety and throw their explosives. Once the explosive goes off, dead fish float up and the fishermen net them in”. Dynamite fishing is extremely harmful to consumers of the fish and also to local marine life and coral. He tells me most buyers don’t know the difference, and because these fish sell at a cheaper price, they are bought quite easily. Authorities who are hired to catch fishermen of this sort often get bribed to close their eyes. Dynamite fishermen also travel as far as Mafia to engage in this type of fishing so the coast guard does not easily catch them. • Inside of cheek should be pink/red but sometimes a bad fish can have this color also so check using the other signs as well. According to Hamisi, fish consumption has increased dramatically since he started business, as hotels and restaurants create big demand. “Everyone wants to eat Fish Miskaki and Prawn Tempura nowadays and therefore seafood will always be in demand.” He also mentioned that there are buyers who ship fresh fish to South Africa via flight on a regular basis, again increasing demand even more. To get your fresh Samaki from Hamisi, get in touch with him on +255 714 488029. Deliveries are free Dar Es Salaam wide!